You've just paid $20 to visit an art museum for the day. You know you're going to love it—wall to wall Picassos and Pollacks—you're getting tons of value for your money. So why would you pay more? Turns out there's a special exhibition on a retrospective of Georgia O'Keefe. As you wander around the permanent collection, flags displaying Georgia's wise face look down at you, advertising this temporary event. Why does this upsell work? Why do you end up spending money on the extra exhibit, money that you didn't plan on spending? ‍You can't get this value anywhere else. The value of seeing these paintings together in this place is unique and time-sensitive. The quality has already been proven for you. Georgia O'Keefe is a known quantity—you know she's pretty good. FOMO. Unique + high quality = fear of missing out if you don't buy that ticket now. Thus, you shell out an extra $13. You can think about your app's value in a similar way. Use upsells to give users a unique opportunity, leave them in no doubt of the value of the upgrade, and subtly tap into their fear of missing out. We've selected 9 top examples from apps that turn upselling into an engagement tactic. Unless users are actively thinking about upgrading, they won't visit your pricing page to learn about higher tier features. Instead of keeping your upgrade prompts locked inside your pricing page, introduce premium features when users are engaged in your app. Branch does a great job of this by integrating higher tier features into their users' current dashboards. When the user discovers the feature and wants to take action to find out more, Branch gives them the option right there and then to upgrade and take advantage. There are many touch points you have with your users beyond your product. Use your newsletter to give users the chance to window-shop features. 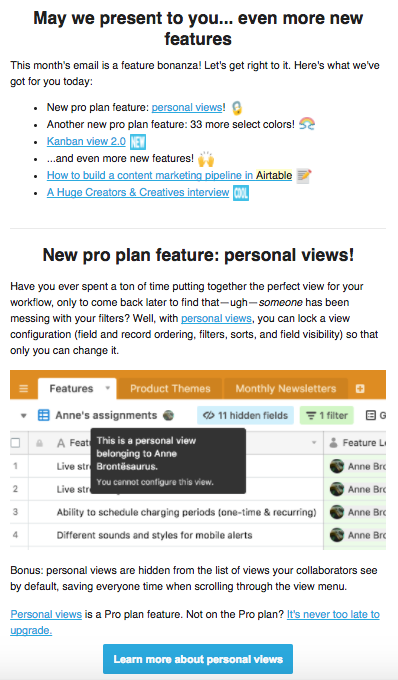 Airtable newsletters are feast-like. They include a range of updates and tips, something to interest every kind of user. Airtable uses these to draw users' eyes towards higher tier features. For example, personal views and new colors are Pro features—Pro users can click through to start using them immediately (with a “Learn more about personal views” CTA), while lower tier customers can click to upgrade (with an “Upgrade to Pro today” CTA). ‍These email CTAs are compounded when the user returns to the app. All along the Airtable UX, neat upgrade CTAs accompany drop-down options, so users are inspired to upgrade when they discover a feature they need. ‍Inspire users to upgrade before you prompt. Make use of your external channels like blogs and newsletters as catalogues, giving users motivation to browse and upgrade. Integrations expand the life of your product. While a user may not be interested in leveling up in your app right now, they may be very interested in using your product alongside another in their stack. 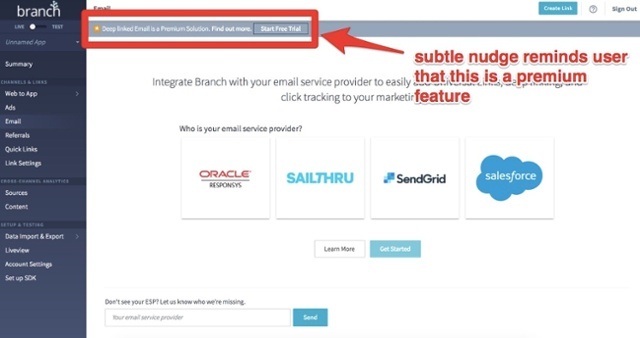 So use your integrations as upselling opportunities—reserve some for higher tier plans and show other users just what they're missing out on. Qualaroo presents upgrade CTAs alongside popular integrations like its Salesforce integration, which is only available to Enterprise users. On the Qualaroo dashboard, a menu of integrations gives users the chance to imagine how each one will improve their Qualaroo account. 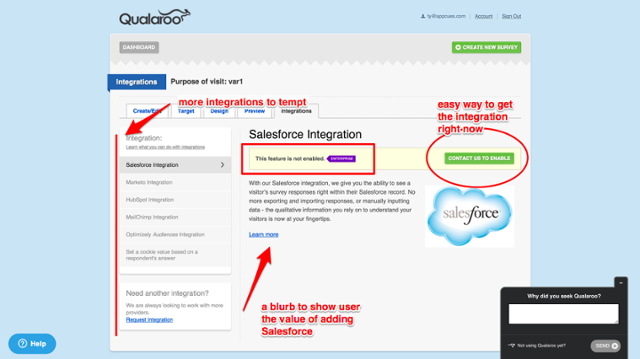 When you open a particular integration, a blurb explaining its benefits appears, along with a button prompting you to enable the integration. Your app's integrations can be the ingredients that inspire users to create bigger and better projects with your tool—ration and celebrate those ingredients to prime them for upsells. Push an upgrade CTA too forcefully while users have just arrived in your app, or are trying to use their current plan's features, and you risk bugging them rather than engaging them. Instead, cue upgrade prompts when users take action to do more in your app. Enable users to discover their own need for your premium features. Zapier triggers this modal window when users click on a higher tier feature, and gives them a single button to upgrade. This works because they're prompting while the user's already motivated, piggy-backing on their existing engagement and creating user-driven momentum. The upgrade window itself is super simple. It tells the user that the action they've attempted requires more plan space and tells them what they need to do. Serve users by saving them time and giving them what you know they need—slot upgrade prompts into the flow of your app and reduce friction for the user trying to get stuff done. Users are very aware of the traditional plan tiers of SaaS apps—free, pro, enterprise and so on—so over-using these words in your upsell prompts is unlikely to catch your user's eye. Make your prompts more unusual, and you'll spark users' interest and create curiosity around further plans. 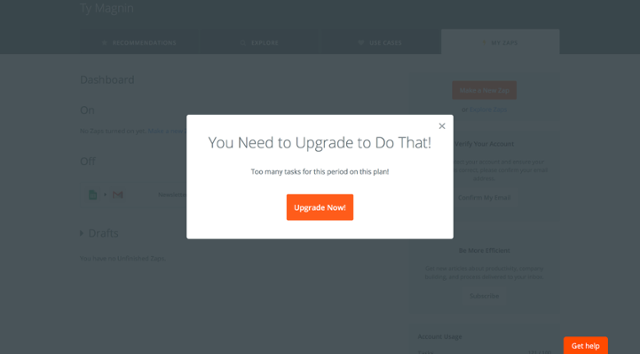 Buffer keeps this upgrade CTA (to upgrade from a paid plan to a more custom paid plan) on users' dashboards. 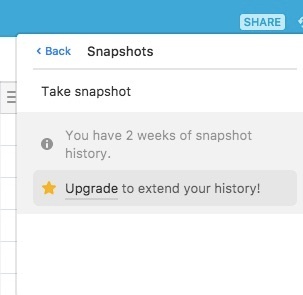 The button copy is action-based and unusual: “Upgrade to Awesome.” While the user's working, they're constantly being reminded of this extra value. Tap into users' powerful fear of missing out by creating curiosity with unusual upgrade prompts. Not only will you inspire them to find out more on this occasion but you'll also make your app more memorable to them in general. Position upsell prompts during a time when the user is actively engaged in learning about your app. You don't have to wait till users have exhausted all the features in their existing plan to prompt them to upgrade. In fact, introducing higher value during onboarding or a product tour could inspire users to invest out of fear of missing out. 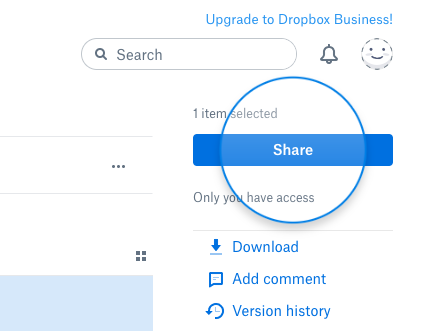 Dropbox does this with multiple sideline upgrade prompts within the app interface. Every interaction with the app presents a good opportunity to remind users about the extra features that are available on higher plans. ‍Catch users' attention while their eyes are actively exploring the space inside your app. A well-placed reminder to upgrade can be very compelling in these situations. Your should always remind your customers how they can benefit from using an improved version of your product. One of the best ways to do this is by adding discrete upsell prompts in the regular workflow of your users. As long as they're not too invasive, these prompts make for great reminders about the value of converting to a higher pricing tier. Use every opportunity to remind your customers of the additional benefits higher plans hold for them. The screens where users spend the most time are the best place to stress the value of upgrading. Identifying the most engaged users of your app and targeting them with upsell prompts is the fastest way to expanding your revenue base. To convince “power users” to upgrade, you must first identify the features that provide the most benefit to them. 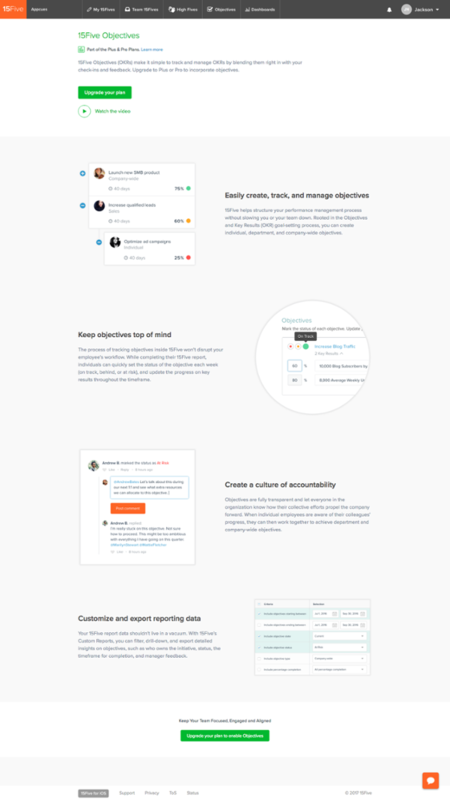 Project management tool Asana does this well. Whenever users on the free plan want to explore an advanced feature of the software, they get a prompt to upgrade. 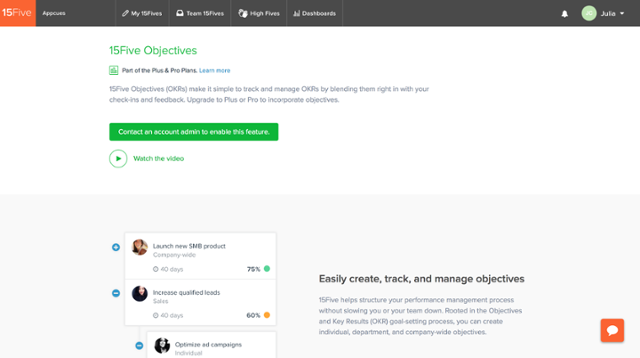 The features that offer an upgrade target users who are already familiar with Asana. 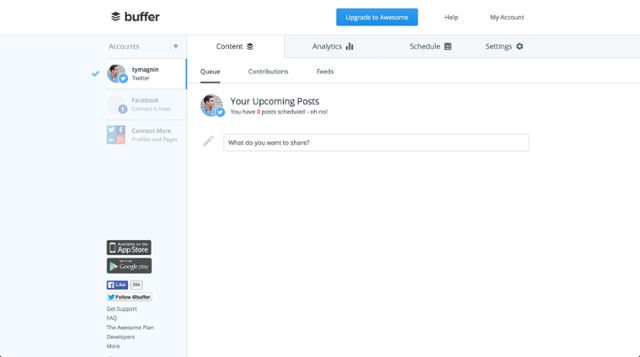 Consider which of your advance features would interest the most engaged users, then display the benefits of those advanced features when "power users" are about to complete an action by using a simpler feature, as a way to entice them into an upgrade. Convincing users to upgrade is easier when your pricing is organized around the most relevant value metric. In this way, you can be confident that you're offering maximum value to every customer segment within your audience. Slack is known for using this technique to fuel its spectacular growth. 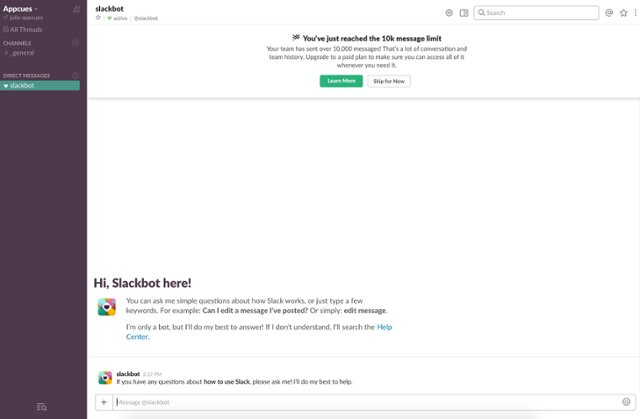 Slack limits organizations on its free plan to 10,000 archived messages. If these organizations want access to their full history, they have to upgrade to a paid plan. The Slack team knows that most of them will quickly hit the limit, so they waste no time to prompt users to upgrade. When an account comes close to the archive limit, the app starts prompting users with the upgrade. 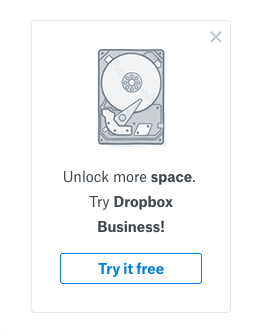 Knowing that users won't want to lose their old messages, Slack uses the opportunity to ask for the sale. Value metrics allow you to segment your customers naturally and extract the most value out of them in the form of a higher priced plan. Target your users with prompts around the value metrics that most matter to them to get them to upgrade their plan. If you try to trick or cajole users into paying for additions and upgrades to your app, you risk losing them altogether. Instead, let users make the next move. When users take initiative, it means they're interested in the upgrade and engaged with your app. The nine companies we've reviewed above take their cues from users before they present an upsell, and it works. Offer new features to your users only when they're already demonstrating engagement in their current plan. That way, users are taking control, don't feel tricked, and begin making their own path towards becoming power users, which will lead them to stick around longer.